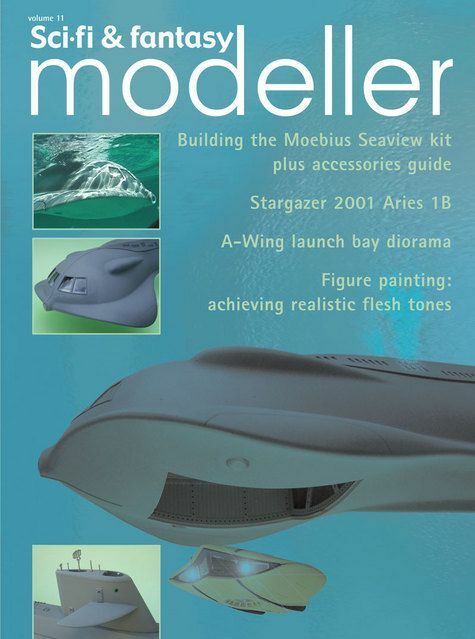 � A review of the new Stargazer Aries 1B kit. � Perfect flesh tones � Barry Ford shows you how, step-by-step, in his inimitable style. � A-Wing diorama from a piece of drainage pipe? No problem � and you'll be amazed at the results! � Thunderbird 3 round house � a large scale scratchbuild with lights and even smoke in the chimney! � Hellboy � garage figure build and scratchbuilt diorama. � Battle damaging the Star Wars Hover Tank. � Building the Aliens Pulse Rifle kit. � Scratchbuilt large-scale Borg cube. � Mak suits and Cosmo Tiger fighters reviewed as only Andy Pearson can. � Jean-Marc Deschamps restores the Liabe � a piece of television history from Message from Space. � New Derek Meddings book review.